I am no better a person for making more money, for having a bigger house than I did, etc. Nor are you, nor anybody else. This is the distinction I was making, especially since so many people have the perspective that making more money is"making something of yourself," or, as you put it, self-improvement. Having lived in 'the real world' and having received my share of bonus checks with the higher rate of deductions from them, then to my surprise, I have to tell you, Mike, it was not a disincentive in the slightest to my working hard to earn that bonus. It did not deter me - the bonus, while having more tax taken out than my normal check, was still very appreciated by me and mine, and made me glad of my efforts even beyond the good work that had gone into earning them! I am sorry that you seem to wish you'd not bothered putting in the work if the amount of increase in pay was not as large as you would have liked. Please know that while there are, evidently, some out there who would turn down more money for their work because it is not enough more, there are plenty of us out here who do not see it as you do. 1. You don't know me. For sure. Among other things. I conflated absolutely nothing. I did not introduce the tangential concept regarding the value of a person vs. the improvement of their financial situation into a thread on taxation. I wouldn't be that condescending and dismissive to people who work very hard daily to count every dollar to make their way through life and worry daily about how to provide for their families. I recognize that level of insensitivity is amusing to some. Not to me. Self-improvement references within a financially-oriented thread may reasonably be construed to consider that a person has improved their living situation with additional income. And, while I may reluctantly agree that only having 50% of your income seized instead of 75% seizure is a marginally better circumstance, I HAVE met people who will not willingly work overtime on hourly jobs for time-and-a-half wages partially because of the immediate punitive tax bite that diminishes the reward for hard work. This is a thread about a question about the fairness of "progressive" taxation. I.e., Is it fair that the top 5-10% pay the majority of taxes? I have answered the OP multiple times, and am comfortable with my answers to him. No one has answered more clearly, the "Yes or No" question than I have. I still think it is a great question. Overtime all depends on the size of the check and the pay period. 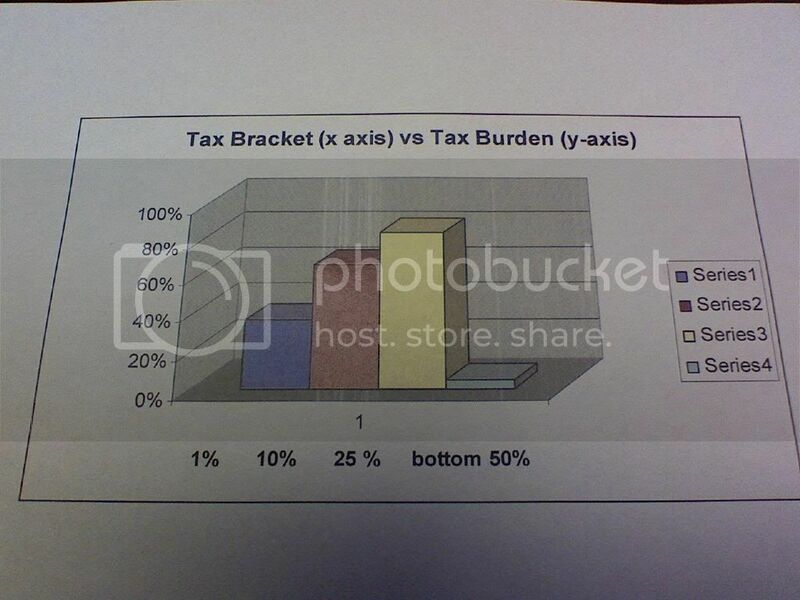 In one position it took me 10 OT hours to make up the fact that I was on the edge of a tax bracket. To me it was not worth it unless I did 20 hours OT and in doing that remove all hopes for an outside of work experience. In the end I pushed myself slightly over the tax bracket at the end of the year but because of unearned income I broke free at the end of the year. You understand first-hand the concept and benefits of "progressive" taxation. Helped keep you in your place, didn't it? That was also during the Clinton years. During the Bush years with very close to the same salary my tax burden has decreases 1000% while revenues for the government have increased.....go figure....voodoo economics. The progressive nature of socialist-based re-distribution of wealth (thanks, Joe the Plummer) is a marked dis-incentive to trying harder. Anyone want to deny that? Many years ago, in Canada, I started my own consulting company. Any income OVER $70k was taxed at a confiscatory rate of 50%; anything over $100k was taxed at, I think, 60%. I know many fellow hard workers who. like me, fled to the US. Doctors found it stupid to work long hours to guide people back to health. Professionals such as I, hardly rich by any standards, were of course seen by the Cheetos-munching illegal immigrants or union thuggist mill workers as "rich". Those hopeless types wanted their unions to really put the knives to the throats of big biz. I even employed two staffers out of my income, but who cares about that! A simple single percentage tax rate combined with a situation-variable basic personal and family tax exemption, is a very rational way to go. Well, in the end I became sorta successful up there. Not only in terms of what I consulted on, but in terms of my own financial success. But it was self-limiting. When you're losing a combined, say, 42% of your life's energy to some re-distribution scheme, done for the sole purpose of gaining votes from those who want to fast-track to an easier life, you can get a bit testy and anti-socialist. Not that I don't want to help my fellow citizen if they're truly needy, but what if they aren't. Most beneficiaries aren't truly needy, just "wanty". Re: a slight digression, but you guys raised the issue; the minimum wage. What a pointless concept. If no-one will work for you because you're only offering $1.26/hour, you'll raise your offer. Or go under. The guy across town who makes identical widgets then to yours offers a bit more per hour to get an edge on the business, and voila, the hourly wage rises. Or you can mandate that anyone, no matter how unproductive, MUST be paid $8 - $10 and hour. What do you really think would happen if we mandated, say, $45 an hour? All would be bliss? What sort of intelligent ethical hard-working healthy individual wants to hang around for long at the responsibility and productivity level that only affords the minimum wage? Get out and learn; go back to school or impress your bosses and move up. I personally know an ex-janitor in Portland, Oregon who, by his very creative mind and hard work, ended up owning his employer's very high tech company. He worked weekends on some apparently insolvable technical problems, and solved them. Now he's a millionaire many times over. And if you are disabled or otherwise compromised, then we should, yes, take care of you on a slding scale. Who would argue otherwise? Who is truly mean-spirited? But meantime keep your greedy, lazy progressive-taxing paws off my hard-earned money. If I'd have wanted that sort of society, I'd catch the next People's Transportation Company bus back to Canada. Plywood seats and all! ALMOST no one has answered the "Yes or No" question better than I have. So what happens to the US of A if we should lose our greatest producers? Our newest IDOLS will become our wonderful Gov't. Y'all think it's bad now? I HAVE met people who will not willingly work overtime on hourly jobs for time-and-a-half wages partially because of the immediate punitive tax bite that diminishes the reward for hard work. A $16.00/hr. guy who doesn't want to work overtime because of the 37% tax bite is an "ideologue?" that "The beating will continue until morale improves?" I tend to disagree, but I tend to have a preference for the little guy. Look at it this way (things reversed for a minute).....If you taxed the poor even more would that give you the incentive to become poor? Or more incentive to not become poor?